in lattice patt on larger needle. 25 1/2" circumference and 8 1/2" tall. -Finished Size: 25 1/2” circumference and 8 1/2” tall. -Yarn: The Fibre Company Tundra (60% baby alpaca, 30% merino wool, 10% silk; 120 yd 110 m/3 1/2 oz 100 g): mink, 3 skeins. -Needles: Sizes 9 (5.5 mm) and 10 (6 mm): 24” circular (cir). Adjust needle size if necessary to obtain the correct gauge. -Notions: Marker (m); cable needle (cn); tapestry needle. -Gauge: 17 sts and 22 rnds = 4” in lattice patt on larger needle. 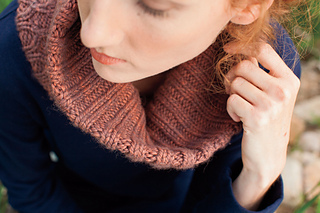 Thick and generous double thick cowl with lattice pattern on one side and ribbing on the other. 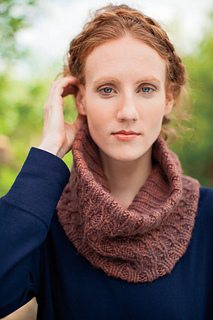 This cowl is knit in the round, then folded in half and seamed to create the double layers. For questions about the increases in this cowl, please come over to the Leadville Cowl thread here for an explanation.